They vowed to bring their brother home. And, after five long days of searching the relentless Niagara River, the body of missing Buffalo Police diver Craig E. Lehner was finally found. Police made an official announcement just after 3 p.m. Tuesday. A procession began an hour later to bring his body from the foot of Porter Avenue to Erie County Medical Center. Police, firefighters and citizens lined the 7-mile route along the Niagara Thruway, Scajaquada Expressway and Kensington Expressway to pay their respects. Buffalo firefighters at the traffic circle on Porter Avenue saluted as the procession passed. As the solemn cortege wound its way through Buffalo, police gave a briefing on the recovery efforts. “It’s a very tragic event, but thankfully we were able to bring our officer back,” said Buffalo Police Commissioner Daniel Derenda at the news conference. Before sunset on Monday, a boat equipped with sonar spotted an image in the river between the International Railway Bridge and Strawberry Island, but it was too late to attempt a dive at the scene. Members of the Buffalo Police Underwater Recovery Team returned to that area Tuesday and located Lehner’s body at about 1:25 p.m. about 160 feet off shore, near Acqua Restaurant on Niagara Street. Det. Leo McGrath, commander of the URT, spotted Lehner’s body floating in the water. McGrath was aboard the team’s boat when he made the discovery. Lehner was in his wet suit and his air tanks were still strapped to him, police said. Police said that the discovery was heartbreaking, but there was satisfaction in knowing it was the team commander who found his lost diver. Lehner’s body was brought aboard the team’s boat and an American flag was placed over him. Because of rough conditions on the river, the 34-year-old K-9 officer’s remains were transported at about 2 p.m. through the Black Rock Channel. His body was then taken to a rowing facility launch near Porter Avenue and placed into a waiting black minivan. Many police officers lined up, stood at attention, and saluted their fallen comrade as his remains were placed into the van for transport to ECMC. Late Monday afternoon, there had been a promising sonar hit right off the Bird Island pier, where the officer went missing Friday, but it turned out to be a tree stump on the river bottom. There were also a number of other sonar hits north of the International Railway Bridge and dives were conducted there as well, but the search was halted at sundown Monday and the area marked off to return to on Tuesday. It was in those waters that McGrath spotted Lehner. Police and firefighters lined up along the wind-swept riverbank to meet the vessel that brought Lehner to shore. Joining them was Mayor Byron W. Brown, who called Lehner’s death a “painful loss” for the officer’s family, Buffalo police and the city. 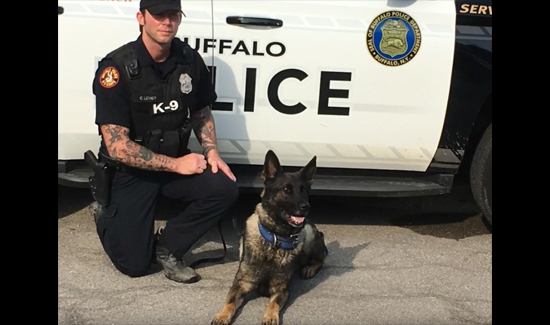 Lehner, a nine-year veteran of the force, is the 52nd member of the Buffalo Police Department to die while on duty or because of an on-duty incident over the past 150 years.